KIEV, Ukraine -- Radisson Blu Hotel Kiev has announced that it will join the Earth Hour worldwide movement on 31 March, 2012 at 8:30 pm and will switch off the hotel's lights and illumination. By this action, the hotel joins the efforts of many other organizations around the world to draw attention to the worldwide issue of global warming. In March 2007 in Sydney, Australia, 2.2 million individuals turned their lights out for one hour for the first time to take a stand against climate change. Electricity production, along with excessive usage of natural resources, results in emissions of greenhouse gasses that cause global warming. Each year more and more individuals, organizations, cities and countries are joining the movement with Earth Hour 2011 seeing hundreds of millions of people across 135 countries switch off for an hour. 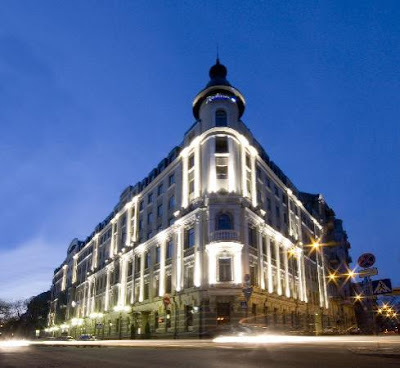 Radisson Blu Hotel Kiev was one of the first business organizations in Ukraine that supported the Earth Hour movement. Since 2009, the last Saturday of March is when the hotel hosts a series of events that aims to draw the attention of guests and employees to the climate challenges facing the planet. The activity which has the greatest impact and involves everyone in the hotel is the switching off of the lights in all guestrooms and public areas. The hotel is lit with candles and each of the two on site restaurants turn into the most romantic places. This year, the Radisson Blu Hotel in Kiev is involved in the event again and has prepared an intensive program for its guests whereby visitors to Mille Miglia Italian Restaurant will experience and join the Earth Hour program by ordering the special set menu of three fabulous dishes cooked without electricity. To make participation in Earth Hour both interesting and informative, there is an invitation to guests and visitors to the K-Largo culinary master class "Cooking with Love to save our Planet". All dishes will be prepared without electricity and the class offers interesting ideas how to create tasty, healthy food while respecting the environment. Guests will be assured that cooking without electricity does not sacrifice nutrition or taste and the attendees will be able to try their hand at cooking their own culinary masterpieces. Radisson Blu Hotel, Kiev is conveniently located in the business and historical city center. It features 255 rooms of Kiev accommodation in 3 unique design styles. Guests can unwind either in the award winning Italian Mille Miglia restaurant, or in the K-Largo Lounge Lobby or experience the fabulous Super Breakfast Buffet. Conveniently located on the ground floor the hotel's Kiev conference facilities span over 407 m. sq. including an Embassy Suite to accommodate 250 people based in reception and four boardrooms for business meetings. The hotel's fitness center features a gym, sauna and steam room, different massage types, and a solarium. Excellent post. All the points mentioned are very important and informative. Thank you for coming up with such brilliant hotel article. Radisson Blu Hotel is a really beautiful hotel, it's a friendly hotel to stay in. It reminds me of my stay in all suites majestique downtown montreal. That's why we keep on going back to this amazing place.